Would you believe the author of “Adventures of Huckleberry Finn,” known as the “Greatest American Novel” of all time was born 178 years ago today? And would you believe that his advice on family and public etiquette as well as inspiring wit and wisdom from greatness, getting things done, and morals, to dress, health, food, and childrearing, etc., are forever relevant. Twain, perhaps the greatest, genius storyteller put himself in everything he did. Image above courtesy of Wikimedia.org. "I came in with Halley's Comet in 1835. It is coming again next year, and I expect to go out with it. It will be the greatest disappointment of my life if I don't go out with Halley's Comet …"
Intriguing that Twain would die of heart attack one day after the comet's closest approach to Earth on April 21, 1910, at his home in Redding, Connecticut. Interesting that although Twain earned a great deal of money from his writings and lectures, he lost a great deal of money in investments. He filed for bankruptcy, and with the help of Henry Huttleston Rogers, principal of Standard Oil, gradually resolved his financial issues. 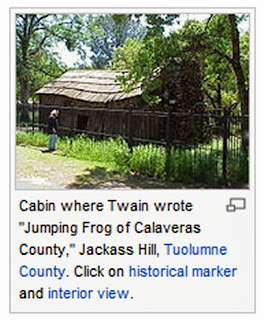 Twain’s first great success as a writer, was in 1865 when he wrote a short story "The Celebrated Jumping Frog of Calaveras County" which brought him national attention. However biographer George Williams III claims that he used “mark twain” in reference to a running bar tab that he frequently incurred while drinking at John Piper's saloon in Virginia City, Nevada. Friend and future Twain biographer Albert Bigelow Paine reported shortly after Twain’s death at his home in Redding, Connecticut that although doctors listed his death as “angina pectoris,” he died of a broken heart. Despite Twain’s successes, his life was filled with tremendous sorrows – the loss of his only son at 2 years old, Langdon (1870 – 1872), a daughter in her early 20s, Suzy (1896 at 24 years old), another at 29 years old, Jean (in 1909), his wife Olivia of 34 years (1904 at 59 years old). His surviving daughter, contralto concert singer, Clara (2nd born of Twain’s 3 daughters), was by his side during his death. ▌▒ http://www.gutenberg.org/browse/authors/t#a53 Works by Mark Twain at Project Gutenberg. More than 60 texts are freely available. ▌▒ http://www.ucpress.edu/series.php?ser=mtl Mark Twain Library, University of California Press. This series re-prints texts from the Papers and Works for students and the general reader. ▌▒ http://www.ucpress.edu/series.php?ser=mtw The Works of Mark Twain, University of California Press. This series prints authoritative critical editions of Mark Twain's published works. 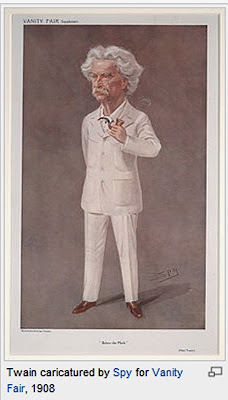 ▌▒ Twain's private papers–his letters, notebooks, unpublished literary works, and autobiography. ▌▒ http://www.ucpress.edu/series.php?ser=jf Jumping Frogs: Undiscovered, Rediscovered, and Celebrated Writings of Mark Twain, University of California Press. The Jumping Frogs series of books brings neglected Mark Twain treasures—stories, tall tales, novels, travelogues, plays, imaginative journalism, speeches, sketches, satires, burlesques, and much more—to readers. ▌▒ http://docsouth.unc.edu/neh/twain/menu.html A True Story, Repeated Word for Word As I Heard It. From The Atlantic Monthly. Nov. 1874: 591–594. Boston: Atlantic Monthly Co., November 1874. Boston: Atlantic Monthly Co., November 1874. It is advantages to maintain a strong cooperation with our writers because they can direct your thoughts into the right direction, allowing your brain to form more ideas and thought-provoking facts about a certain assignment, have a glimpse at the hyperlink to find more information!